Basting Sop & Glaze for Poultry is just what it says. You use the sop for keep the chicken moist and tender while at the same time applying seasoning and flavor. 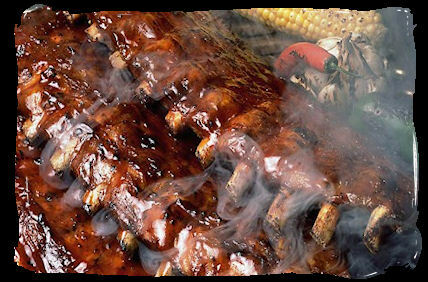 Then as an added bonus, you apply the baste to produce a very nice glaze on the meat for better taste and appearance. You won't be disappointed! Enjoy. Now this is where we start to have some fun! Rinse and pat dry the chicken removing all excess moisture. In a glass/plastic bowl, place the chicken, Italian dressing and pepper. Coat generously. (If you have the time and the urge, take your fingers and run them under the skin and allow some of the seasoning to get between the skin and the meat - It will flavor and keep the meat moist) Next, remove the chicken, cover and set aside for 1 hour in the refrigerator. Prepare the grill for indirect heat cooking (fire on one side and the meat on the other) with a water pan with 1/4 inch of water in it under where the chicken will be. Bring the pit up to 300°. While the fire is building, in a shallow pan, simmer the butter until just melted. Add the salt, lemon juice, paprika, garlic powder, and Worcestershire sauce and simmer a few minutes more. Remove and keep warm. Next, prepare the basting glaze by combine the apple juice, barbecue sauce and maple De. Set aside. Now that things are ready, place the chicken on the pit over the water pan and cook for 10 minutes untouched. Then begin basting each 10 to 15 minutes with the butter/spice mixture until almost done. During the last 20 minutes, baste a couple of times with the basting glaze. OK, for you guys who don't have room for indirect heat cooking, grill as you would normally do. Try not to burn the skin. As you reach the end of cooking, allow the fire to reduce to a warm temperature (not hot). Coat the chicken with the glaze and cover for 10 minutes. Coat and cover for 10 minutes a second time. You will end up with the same nice results! When the thickest part of the meat reaches 155° to 160°, remove and allow to cool for 10 minutes before serving.